Lens Description: The dedicated APO teleconverter can be mounted between select lenses and camera body to increase the focal length by the power of 1.4x. The new multi layer coating reduces flare and ghost, which is a common problem with digital cameras. They demonstrate best performance with DG series lenses. They also offer maximum photography magnification by 1.4 x, without any variation in the minimum focusing distance. Compact and lightweight, these teleconverter convert your lenses into longer focal-length lenses, so you don\'t have to do a lot of unnecessary footwork. Photography Life Review Summary: The Sigma 1.4x teleconverter seems to be a pretty solid choice for Sigma lenses. As you can see from this review, it works very well with the new Sigma 120-300mm f/2.8 Sport lens and shows impressive performance when stopped down to f/5.6 range and smaller. It is a very compact teleconverter that only weighs 160 grams, so you could leave it on the 120-300mm f/2.8 lens without adding much more weight. Optically, it seems to be as good as the Nikon TC-14E II teleconverter in the center, but it clearly is not suited to be used with Nikkor lenses. Not only does it break the communication between the lens and the camera as noted earlier in this review, but it also makes autofocus go in a loop, causing the focus to go back and forth erratically. This brings up a whole different issue - lens and cross brand compatibility. 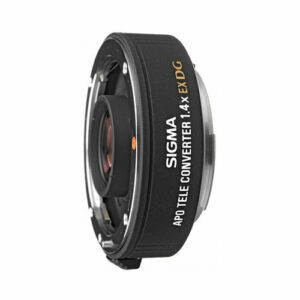 It looks like none of the Nikon teleconverters will work with Sigma lenses, and none of the Sigma teleconverters are designed to work with Nikon lenses either! So if you already own Nikon lenses and teleconverters and you are getting yourself the Sigma 120-300mm, you will also have to purchase a Sigma teleconverter with it as well... Read the full Sigma 1.4x EX DG Teleconverter Review by Photography Life.